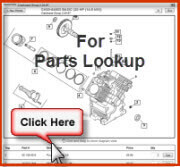 Shop our huge parts diagram database, searchable by brand, model number, spec number, part number and save. If all you have is a serial number call us at 888-652-3990 or email us sales@opeengines.com and we would be glad to look it up fo you. *The prices shown here in the parts diagram are list prices. *When you "add to cart" you will see savings up to 52% Off the list price. Note: When selecting lookup for Kohler K Series or M Series and the "Select Assembly" and it shows nothing. These Kohler Series of engines have been discontinued from Kohlers Lookup and we can help. Free Shipping when order reaches $90.00.